A flexible approach to your needs and the ultimate in packaging variety will enhance your products, giving them a competitive edge on the market thanks to their additional appeal. In today’s world of fast-moving confectionery trends, only IMA has the ability to respond to the most diverse processing and packaging requirements. A ﬂexible approach to your needs and the ultimate in packaging variety will enhance your products, giving them a competitive edge on the market thanks to their additional appeal. Whatever your specialty or your speciﬁc objective, IMA can provide turnkey solutions based on decades of experience and home-grown technologies which will transform your ideas into reality. A team of international sales staﬀ with in-depth knowledge of your sector and a strong technical background in processing and packaging are at your disposal to deliver the solution you require. IMA has the most ﬂexible answers for each step of the process. Powder handling, dosing, mixing, granulation or compression. Powder layering and coating of cores, should they be tablets, small pellets, almonds, or chocolate units. It is the know-how, or better, the know-why behind the technical solutions themselves that makes IMA technologies suitable for any application. A high-performance equipment able to handle gum slabs, sticks and pellets providing a variety of packaging solutions according to your needs. High-speed processing, accuracy and optimum product handling are the key characteristics of the machines dedicated to gum packaging. The art of feeding soft and hard candies, gum pellets and other solid products is one of IMA’s strong points, oﬀering you a wide range of packaging solutions in plastic and metal containers of various types and sizes, with dispensers or top opening, pressure or screw caps, to best meet all of your requirements. MORE THAN 50 YEARS OF EXPERIENCE in manufacturing automatic ﬂow packing machines and lines for handling, feeding and packaging products such as candies, jellies, lollipops, bubblegums, chewing gums, chocolate, crackers, instant noodles, layer and sponge cakes, marshmallows, plain and ﬁlled biscuits, snacks, bars, wafers and sweets in general. We can oﬀer a wide range of standardised machine models and tailor-made fully customised systems. In order to ensure your products stay in perfect shape for longer at each point of sale, our overwrapping solutions oﬀer precision and premium quality. The Fin Seal versions hermetically seal each package to protect the contents from moisture and thus prolong their shelf-life.Not just simple trays, but an array of packaging solutions for display boxes that, with minor technical adjustments, can help you cut production costs while maintaining high quality countertop presentation. IMA has a long tradition of designing and manufacturing end-of-line machines. The machines and feeder units are extremely ﬂexible, enabling the processing of countless types of product and package. The constant ﬂow of ideas generated by our close-knit team has resulted in a number of innovative concepts such as machines with a small footprint, integrated packaging solutions, rapid size changeover and the handling of complex or non-standard products. Simple to use and easily accessible, they guarantee maximum protection for both operator and product, at every stage of production. 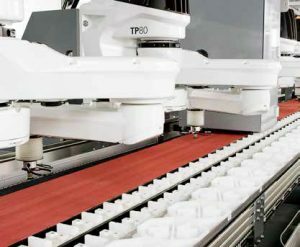 Customized solutions complete with robot solutions (i.e: Gantry Robots) and integration of additional manipulators made by standard robotics, providing tailor-made productive cell design.